I wish I saw the customizable key tag sooner because I totally would've ordered this for all of my secret santa gift exchanges this year. You can personalize the keychain to say whatever you want, but I thought "getaway car" is cute, especially if you're obsessed with Taylor Swift's new song! 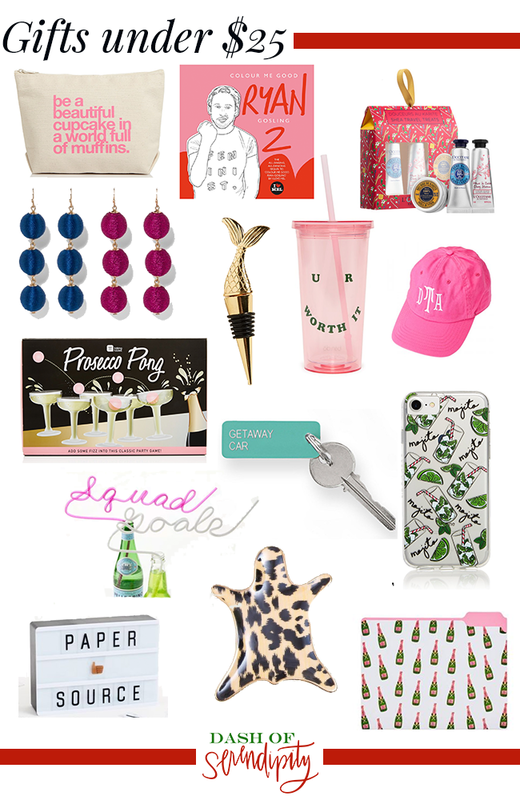 Want to win the cute earring set from this gift guide? Leave a comment on this post about which gift is your favorite with your email address! The winner will be announced on Saturday 12/9! My favorite gift idea is a good coffee table book. It is easy to know the basic things that someone loves and get them a book to match their needs! Thanks so much for doing this giveaway! My favorite is definitely the Mini Light Box! It is super cute! Also, great for all year long to create different messages! I really love the prosecco pong. The box itself is already perfect for gift giving! My favorite Christmas happy to give is cute cocktail napkins with fun things on them or good homemade Chex mix with fun holiday wrapping, because who doesn’t love a good holiday snack!! !